Overhauling a generator comes from different components: you have the engine that drives the generator, the alternator and the generator itself. Either one could fail. 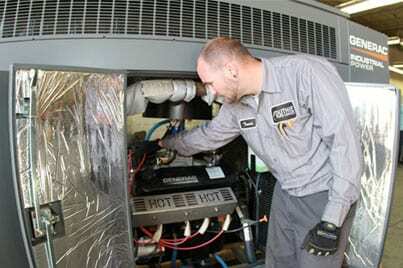 And that repair may cause an overhaul of the engine or overhaul of the generator itself. That can take a long period of time because the engine has to be disassembled and removed. Overhauled, tested and reinstalled and then tested again. So, that’s why a lot of times we need to have a rental generator as a backup (if your generator is going to be down). There are a lot of smaller components, block heaters, battery chargers, batteries themselves that all need to be replaced. A lot of that can be done within an hour or so. So there’s not a problem with downtime but more extreme repairs, overhauls or major work – we do need a rental backup generator to cover that building during the time of that repair. Just like building an engine in your car or overhauling the complete brake system, it depends on the component or part of the generator that has failed. It can be anywhere from a major repair (or major overhaul) to replacing turbochargers, injectors or cylinder heads – it just depends on how severe the damage is – but it can become quite a large job.